Why provide plain bottles of water at your event (shower, wedding, party, etc) when you can provide these cuties? The template is a compressed .zip file. Click here for instructions to extract. I made the graphic in photoshop first. You can use a monogram or your own image. I pasted them into the middle of a Word table (see template) and printed these in color. Maintain the row height of 1.7" so that it is smaller than your packaging tape width. Then, start up the printer! Cut up the labels. 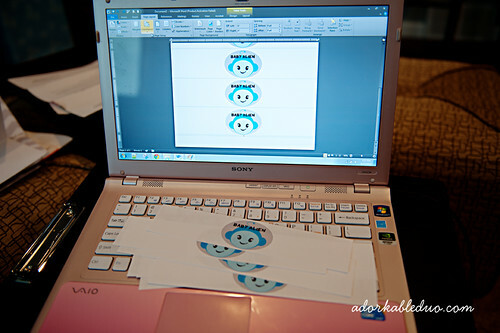 I used a fiskars paper cutter for ease. Then, one by one, I took the packaging tape and taped over the labels, leaving tape around the perimeter so that it can stick to the bottle. Apply those babies to the naked bottles and presto!